The City of Houston will receive $1,175,954,338 in Community Development Block Grant Disaster Recovery (CDBG-DR) funds for assisting in long-term housing recovery from Hurricane Harvey. To receive this funding, the City submitted a Local Action Plan to the Texas General Land Office (GLO), which was incorporated into the State of Texas Plan for Disaster Recovery: Hurricane Harvey – Round 1 (Plan) as a substantial amendment. HUD approved this amendment on December 11, 2018. January 25, 2019 update: The City will receive at additional $99,923,703 in CDBG-DR funds for long-term housing recovery from Hurricane Harvey. To receive this funding, the City must update portions of the GLO's Plan, which will be incorporated into the Plan's Amendment 3. See the Public Notices page for instructions on how to submit comments on the City's proposed changes. Click to open a summary of the City of Houston Local Action Plan. 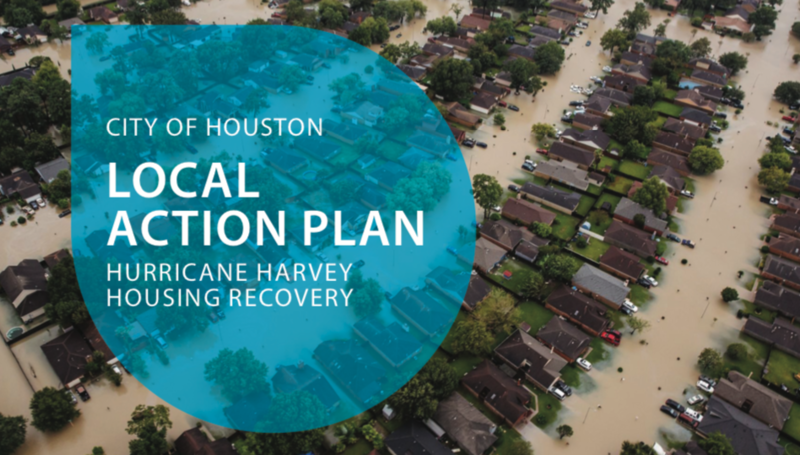 The Local Action Plan identifies proposed activities for long-term recovery and restoration of housing in Houston. As Houston receives additional funding, reallocates funds, or changes activities, the City will submit amendments to the Action Plan to the GLO and HUD for approval. The requirements for federal funds for Hurricane Harvey recovery are laid out in a series of Federal Register Notices published by HUD. After Hurricane Harvey, the City of Houston recognized that it needed to understand the full impact of the storm on residential structures in the city. The City partnered with Civis Analytics to develop a new methodology for calculating unmet need from a major disaster. The methodology is important because it doesn’t simply rely on FEMA claims for Individual Assistance. Rather, Houston’s methodology looks at which buildings were damaged as the basis for calculating unmet housing need. The model also looks at the impact on socially vulnerable communities. The City's methodology focuses on identifying socially vulnerable Houstonians who may face special challenges in making a full recovery. See the City's map of disaster impact and social vulnerability. Houstonians have a right to have their voices heard in the disaster recovery process. 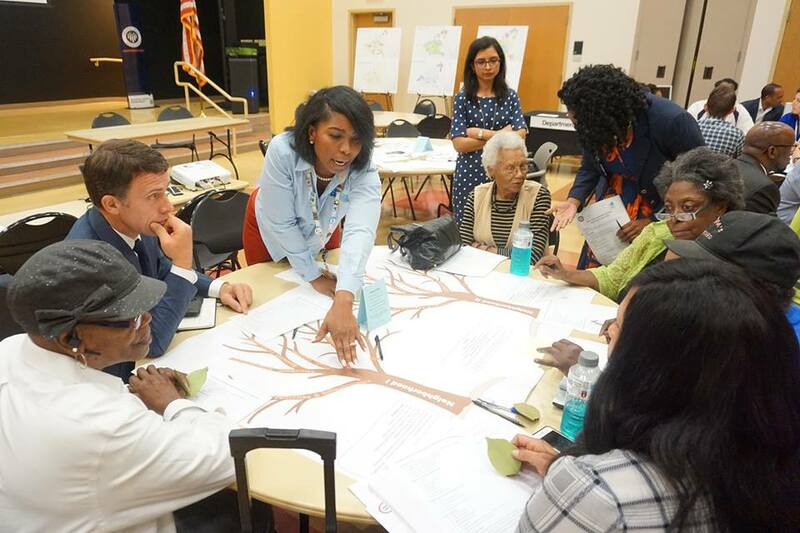 Beginning with the Local Action Plan, the City has undertaken new approaches to reach more Houstonians to give input about the recovery process. The City is using in-person meetings, online resources, and tele-townhalls to create avenues for feedback on disaster plans and programs. Community engagement plays a central role in the recovery process. Follow @HoustonHCDD on social media for regular updates on recovery events and opportunities for feedback. Each program area under the City of Houston’s Local Action Plan is governed by program guidelines. These guidelines spell out program activities, targets, and spending plans. Public notices are posted here. The City of Houston Housing and Community Development Department (HCDD) welcomes feedback and complaints from any member of the public. Complaints are accepted in writing or over the telephone. Complaints will be responded to in writing within 15 business days, when possible. Complaints of fraud, waste or abuse must be immediately escalated to the City of Houston Office of Inspector General (OIG), regardless of whether the complaint is informal or formal. HCDD will make all efforts to ensure cooperation with the OIG. HCDD recommends, but does not require, using the HCDD Appeal Form to ensure a timely response and decision. The HCDD Appeal Form is available at our office during normal business hours or you may or you may download a PDF form here. You can also complete the Appeal Form online here. Complainants and appellants should initially contact their local jurisdiction (City of Houston Housing and Community Development Department) in accordance with their local policies and procedures for customer complaints. However, should the complainant or appellant not be satisfied with the outcome of their process with HCDD, they have the right to escalate the complaint or appeal to the Texas General Land Office (GLO). The GLO will provide a timely response. The response will be provided within 15 working days of the receipt of the complaint or appeal, if possible.